Native American arts and artifacts appeal to collectors for their beauty, their historical significance and their spiritual connections. Maria Popovi Black on Black Feather Plate, dated 11/67, 1/2" x 6.75"
The pottery, weavings and other artifacts of Native American culture have not always fared well under the onslaught of Europeans, nor did the artisans themselves. Since most artifacts were utilitarian, disposable, and by the nature of their materials ephemeral, intact examples of early work are extremely rare and are highly valued. In the West, pots and weavings were sold as functional objects as trading posts and early travelers collected Indian items as curiosities. Appreciation of indigenous cultures began to grow and awareness of the social and religious significance of their artifacts – as well as the high quality of their craft – raised the level of interest by collectors. Native American artists of the West have received most of that interest. 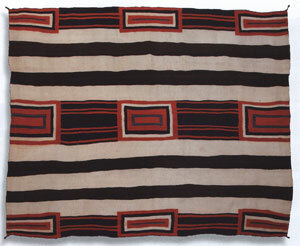 Sioux Beaded Blanket Strip with American Flag Design, circa 1890, 63" x 3.25"
Among the most recognizable of functional Native American art is the pottery of Maria Martinez (1887-1980) of San Ildefonso Pueblo just north of Santa Fe, New Mexico. Maria and her husband Julian developed a way to have both glazed and matte areas in the decoration of traditional blackware pottery. After Julian’s death, she collaborated with her daughter-in-law Santana and her son, Popovi Da. Maria began the tradition of signing her work. In Maria’s youth the traditional craft of pottery making had waned because of the availability of mass-produced utilitarian items. She made pots, nevertheless, and became known for the quality of her work and for keeping the tradition alive. In the early years of the 20th century Maria was asked to replicate polychrome pots discovered in excavations at Pueblo sites for the Museum of New Mexico. Among the pottery shards were pieces with a polished black surface. Marie, Black on Black Avanyu Vase, circa 1930, 13" x 8"
After many experiments, she and Julian perfected a technique of making glossy pots with matte black designs. This black-on-black process brought them fame around the world. Maria didn’t keep her innovations to herself, however, and helped other potters to perfect their skills. Maria and Julian’s technique involved burnishing a layer of fine clap slip until it became shiny. The designs were then painted on and, in the process of firing, turned matte against the glossy background. The ancient firing process itself was modified to make red clay black. Maria discovered that after the burning wood and dried cow manure reached a certain temperature, she could smother fire with fresh manure or fire ash to create a dense smoke that turned the pots black. The process is called “reduction firing” because the amount of oxygen in the adobe kiln is reduced. Maria Antonia Montoya Martinez didn’t sign her wares because she felt no need to claim them. When she and Julian’s work became more popular she decided to sign them “Marie,” the non-Indian spelling of her name. She didn’t include Julian’s name until about 1925 because pottery was traditionally a woman’s work. In their partnership, Maria formed the pots and Julian applied the decoration. Navajo Crystal Textile, circa 1900, 88" x 49"
A pot from about 1930 and decorated by Julian bears only the signature “Marie.” The black-on-black Avanyu vase bears the design of a water serpent or ‘avanyu” in the Tewa language of the Pueblo. Avanyu was the guardian of the springs and symbolizes the source of water. A jar from the same year bearing a stylized bear paw and geometric design is signed “Marie and Julian.” The bear paw symbolizes inner strength. After Julian’s death in 1943, their son Adam and his wife Santana helped Maria with the work. A jar from about 1950 with a design of the Avanyu is signed “Marie & Santana.” Adam and Santana began doing their own work about 1956 when Maria began to work with her third son Antonio, who had taken his Indian name Popovi Da. She returned to her given name, Maria, and signed their collaborations “Maria/Popovi” and, in 1959, began to include the month and year. 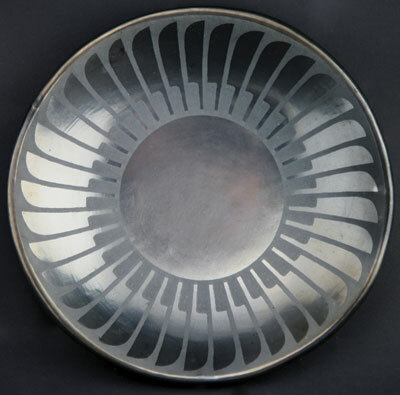 Their “Feather Plate,” dated “11/67” features a repeated pattern of stylized eagle feathers. Maria’s undecorated pottery such as the “Black Polished Bowl” bears her Hispanic name as well as her Indian name, “Maria Poveka.” Pottery from all periods of Maria’s life is among the most sought after Indian pottery. Margaret Tafoya 91904-2001) was the daughter of Sara Fina Tafoya (1863-1949) of Santa Clara, Pueblo, which adjoins San Ildefonso, Sara Fina is generally credited with beginning the tradition of carved Santa Clara blackware in the early 1920s. Margaret’s descendants and extended family continue the traditions of Santa Clara pottery making and have introduced contemporary variants into the tradition. 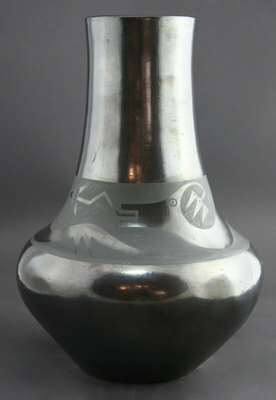 A “Blackware Jar” made by Margaret recently brought $30,000 at the 2008 American Indian Art Auction at Altermann Galleries and Auctioneers in Santa Fe. Zuni Nahalish Corn Dancer, circa 1930, 9" x 3" x 2.5"
At the same auction a “Polychrome Pot with Bird Motif,” made in about 1910 at Zia Pueblo, brought $37,800. The clay of Zia Pueblo, west of Albuquerque, New Mexico, fires to a rich red color. The polychrome design of a Zia bird and flowers is painted onto a thin buff colored slip or thin layer of clay applied to the pot before it is fired. Many of the Pueblos produced work for tourists to a lesser quality than their tradition demanded, but this pot has the shape and delicate design of some of the best. The pottery made for sale in the early 1900s brought in enough money, however, to keep the Pueblo from starvation during outbreaks of smallpox and influenza. The design of Zia Pueblo pottery has remained essentially unchanged for centuries and remains uninfluenced by European styles. 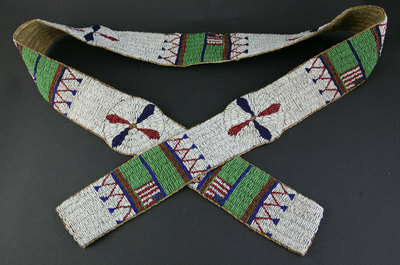 War shirts and other clothing of the Plains Indians were often decorated with intricate beadwork. Beads were carved from natural materials until the introduction of glass beads from Europe nearly 500 years ago. Christopher Columbus recorded in his logbook that his crew gave glass beads to the natives of San Salvador Island. Even before the Europeans arrived, however, beads were used in trade and it is not surprising to find beads made from abalone shell, for instance, in the designs of Plains Indians. 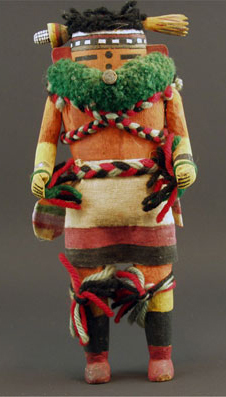 Some of the most popular “collectibles” today are Kachina dolls, also spelled katsina. In Western Pueblo tradition, a Kachina is a life-bringer, a supernatural being. The carved wood figures were intended to be teaching aids (rather than toys) to introduce young people to the attributes of the kachina they represent. Navajo Third Phase Chiefs Variant, circa 1910-20, 70.5" x 67"
In Hopi mythology there is a kachina that overlooks the germination of seed, another who oversees the growing of crops, and yet another who ensures the good behavior of children. There are nearly 200 others. Kachinas exist as spirits, as dancers in festivals, and as the carved figures we are more familiar with. Perhaps the most familiar is the Kokopeli Kachian, the humpbacked flute player who has become almost a universal symbol of the Southwest. Kokopelli has many attributes, bringing gifts and babies, and one who helps hunters. Soon, his most important work will be done when he brings spring back to the earth. And, if you listen carefully, you will here his flute in the spring breeze. Dr. Mark Sublette, owner of Medicine Man Gallery in Tucson, Arizona, and Santa Fe, New Mexico, is an expert on the history and style of Navajo rugs. According to Dr. Sublette, Navajo women learned weaving in the 1600s from their Pueblo neighbors. Navajo tradition, however, describes the introduction of weaving by Spider Woman, one of the Holy People. In Navajo myth the people were led out of the Underworld to the Southwest by the Holy People. He describes the complicated and tragic history of the Navajo people in the 19th century and the influences on their designs and materials. 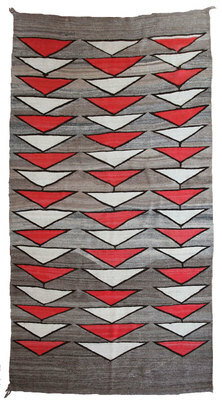 The complex influences on the greater society continued to impact Navajo weaving after their return from Bosque Redondo.